This lesson plan introduces students to archival and oral history research as they work to uncover the history of their school. The plan is based on a project conducted by John Eaton Elementary School for the institution's Centennial Anniversary Celebration. The students produced an exhibit, and a website based on their findings. The John Eaton Elementary School Centennial Website can be found here. 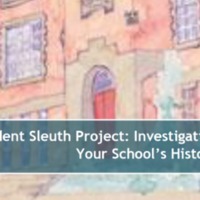 Koerner, Michelle and Langholtz, Eileen, “Student Sleuth Project: Investigating Your School's History,” DC Digital Museum, accessed April 22, 2019, https://wdchumanities.org/dcdm/items/show/1539.